One Tribe is a new world music festival founded by the Audio Farm crew, who have been putting on events in Manchester and North Wales since 2009. Over the past four summers they have staged annual festivals under their own name, with the latter two selling out. Stepping things up from an 800 to a 2500 capacity event in 2017, the inaugural One Tribe will comprise five days worth of international talent across seven stages, along with wellness activities, circus performers, workshops and talks, all manner of artisans, drumming collectives, and a philosophy of participation and oneness. In keeping with this ethos, all of the proceeds from the event will be donated to the wildlife conservation charity, the Green Paw Project. Insights spoke with One Tribe founder Stephen Chesters about its philanthropic ambitions, onsite activities, and the specifics of its financial system. 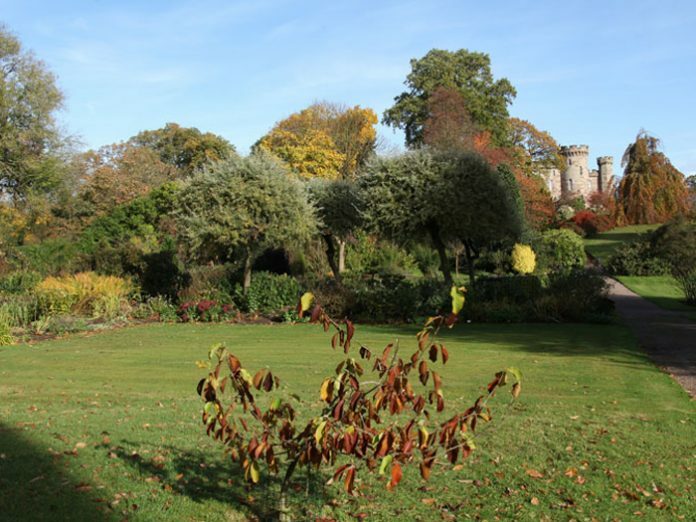 Festival Insights: The setting of One Tribe, Cholmondeley Castle, looks beautiful. How will you be making the most of the site, and what sorts of activities and entertainment can festivalgoers expect? Stephen Chesters: One Tribe will invite the world’s finest DJs, bands and artists to perform across seven carefully curated stages. As the music flows through the sound systems, a spectrum of circus performers, fire eaters, acrobats, artisans and drumming collectives will confound, dazzle, delight and inspire, punctuating the festival story. We also want the festival to be a safe space for our audience to expand their skill sets with workshops and talks, and to explore alternative treatments to rejuvenate the mind, body, and soul through holistic disciplines, massage, guided meditation, gong baths and yoga. Two of the seven music stages will be set amongst the canopy of the trees, with The Ambient Stage being open for 24 hours a day – a rarity in the UK. FI: All proceeds of the event will be donated to the wildlife charity The Green Paw Project, with an aim to raise £50,000 this year. How exactly will the donation be utilised by the Project? SC: The Green Paw Project is a UK registered charity which I founded. The mission of the Green Paw Project is to improve animal welfare in Malawi by providing veterinary care for domestic animals and wildlife, and providing education on the subject. Beyond that, its primary objectives involve permaculture, nutrition, and the teaching of Malawian undergraduate vets. The money will be used for building the infrastructure and accommodations at Kande Horse Ranch, as well as constructing wildlife quarantine / holding facilities, a veterinary clinic, and running a mobile veterinary service from Kande for Mzuzu, Nkhata Bay, and the surrounding areas. We will focus our attention in the North of Malawi, where wildlife and veterinary services are needed the most. At the facility, the Green Paw Project will be taking in orphaned monkeys and injured wildlife, rehabilitating them in order to release back into the wild. The charity will also educate the locals on wildlife and domestic animal welfare. Fighting against the poaching of elephants and Africa’s big five will be another key focus. The aim is to raise more and more funds each year via One Tribe and keep pumping money into both the Green Paw Project and similar initiatives across The Amazon and the UK. FI: What exactly is the Charity Financial Fair Scheme that you’re implementing, and how does it work? SC: The One Tribe Festival ethos is that we are all one. This belief is replicated throughout the festival’s financial structure by implementing our Charity Financial Fairness System. We believe in equality amongst everyone involved in this event, including the organisers. In this revolutionary anti-corporate festival financial system, we must all work together as ‘one tribe’. So, we are asking for everyone that is involved to join us in unity. FI: In the past couple of years, festivals such as Shambala and Gothenburg’s Way Out West have notably gone vegetarian and even vegan in their catering. One Tribe states that its food ethos is one of ‘sustainable, cruelty free, quality vegan food’ – does this mean that 100% of food sold onsite will be free from animal products? Do you think more festivals will lead the way in this area in future? SC: Yes we are a 100% vegan festival. We believe more festivals will follow suit too. We have a platform to show that you can eat amazing tasty food that is cruelty-free, and much healthier for the mind, body and soul. Plus agriculture is the biggest cause of greenhouse gases in the world. Change is happening though. The world is awakening and we are aiming to aid this revolution. Most people leave our festival with the thought ‘wow, I actually don’t need meat’. But we do have vegan food which everyone can relate to, like pizza, full English breakfasts, vegan fish & chips, Thai, Indian, vegan sushi, burgers, and even chocolate and ice cream. FI: Attendees are encouraged to bring their own instruments for nighttime jam sessions. Do you think this kind of audience interaction and participation is integral to a proper, communal festival experience? SC: Yes, it’s a core element of the Audio Farm / One Tribe vibe. We have three huge drumming collectives: Drum Machine, The Beatniks, and Treedrummers, who will join us for the 50-plus drumming jams in front of the sacred fire with the 75-plus fire performers. We encourage anyone with an instrument to join in. Every night, there is a very special energy. FI: How will One Tribe be catering towards families, both logistically and entertainment-wise? SC: We’ll have a special little enclave for our junior festivalgoers with a bumper selection of fun workshops, classes and games, all especially tailored for the young and enquiring mind. FI: Over 30 collectives will be supporting the festival, from Meat Free to Illuminaughty and Hit & Run. Does this mean that the programming of One Tribe was a collaborative process between all of these different promoters? SC: Yes that’s right. The idea is the ethos is One Tribe. We are all one. One love, one tribe. 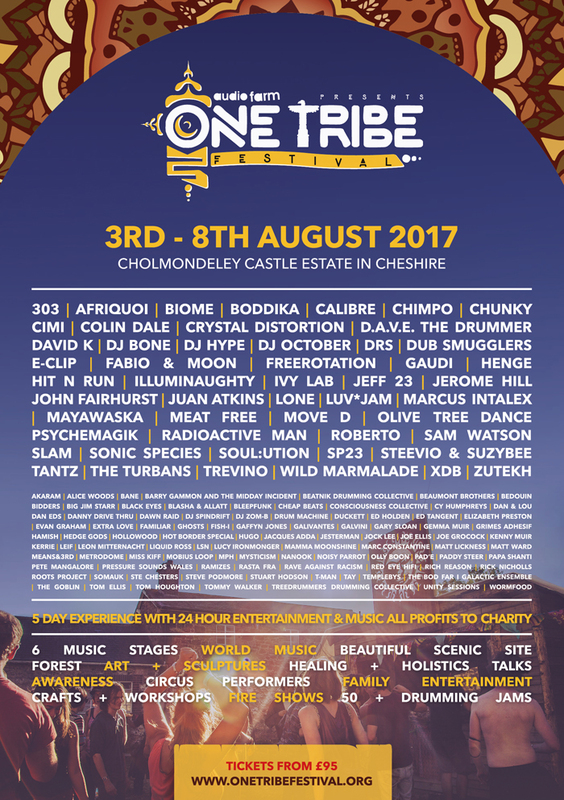 Check out the line-up for One Tribe Festival below.